Hi there!!! I know, I know... my blog went silent again. It's been a long couple of weeks for me with my dad having heart surgery last week. There were some major complications during the surgery which I won't go in to but that meant I was out of town for a few days and then I had to head straight back to work (my first day back was a 13 hour trip to Vancouver for a workshop). To be honest, I'm exhausted both emotionally and physically. I needed to check out for a bit to realize all that has gone on. Good news is that my dad is now home!! Thank goodness. I urge you all to hug your loved ones!! But that's not why you're here, is it? You're here for Bellarific Friday. 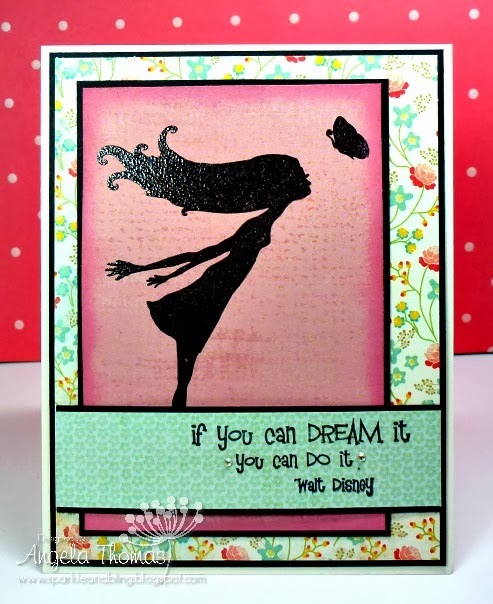 This week we had a sketch and I decided to go simple and use Jane Girl which is a silhouette stamp. ( I didn't have the energy to even think about coloring anything). Super simple, I tell ya!!! Next week's challenge is Monochromatic Friday. Pick your favorite Bella Stamp and choose one color to bring it to life including your papers.. wow! that’s a challenge!! !